These insects are the most common insects found in our region. Argentine Ant – The Argentine ant is easily distinguished by its body regions’ very narrow attachments. The ant has a large distinct head with elbowed antennae, which is segmented, and may end in a club. These ants have easily visible eyes and chewing mouthparts. 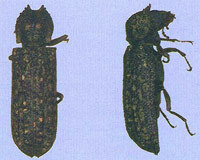 Workers are 1/8 inch long and light to dark brown in color. Queens are ¼ inch long, brown and covered with fine hair. These ants lack spines, and their eyes are very close to the base of their antennae. Argentine ants generally live in nests outdoors, yet they can often forage indoors for food. Bed Bug – The bed bug is becoming far more prevalent in the United States primarily due to increased foreign travel. The adults are 3/16 inch long, oval, flat, and rusty-red in color. 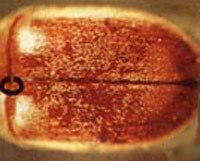 When bed bugs have not had a recent blood meal they will be flat, but will become more plump after a blood meal. Bed bugs hide in cracks and crevices during the day, but leave harborage areas at night to feed on their hosts, commonly humans and pets. Females will lay 200-500 eggs during their lifetime in cracks and crevices of harborage areas. A bed bug bite may become inflamed and itch severely on those with sensitive skin. Bed bugs do not transmit any diseases. Learn more about bed bugs (pdf), and how to prepare for an effective treatment. Boxelder Bug –An adult boxelder bug is 1/2 inch long, and brown-black in color with three red stripes on the thorax. Boxelder bugs are fond of feeding on leaves and twigs, but will also feed on maple, ash, and fruits. These insects will emerge in the spring and lay small red eggs in cracks and crevices in the bark of boxelder trees. The nymphs will hatch around the time when new leaves appear, and will feed on the juice of the leaves. 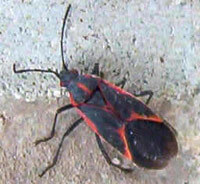 Boxelder bugs are simply a nuisance when they attempt to enter the home to find over- wintering sites. They can stain blinds and drapes with their feces, and they do have the ability to bite. When crushed these insects will emit a strong odor. Camelback Cricket (Cave Cricket) – The camelback cricket has a humpbacked thorax resembling the hump of a camel. These insects are generally 1/2 to 1 1/5 inches long and have the ability to jump and move very quickly. The color will vary from light tan to dark brown and often have dark bands on some segments. These crickets lay eggs in the spring to hatch in April. Camelback crickets are typically found in leaf litter, under logs or stones, but will move into homes in the fall when looking for a place to over-winter. Carpenter Ants – Carpenter ants are the largest ants found in the United States ranging from 1/4 to 1/2 inch long. Carpenter ants are generally black, and have an evenly rounded thorax when viewed from the side. Carpenter ants will excavate galleries or tunnels in rotting or sound trees, as well as wooden portions of structures to nest. 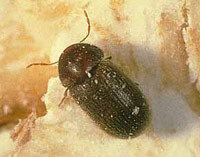 These insects are often found in conjunction with moisture problems. Workers will often expel “frass”, a fibrous sawdust, usually found close to the location of carpenter ant nests. Carpenter Bee – Carpenter bees are large insects and look very similar to a bumblebee. The primary difference is a carpenter bee has a shiny black abdomen as opposed to a hairy abdomen. 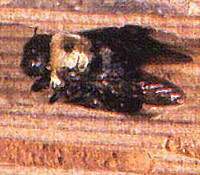 Male carpenter bees are unable to sting, and females will only sting when molested. Carpenter bees bore holes in wood creating a tunnel to lay eggs and raise their young. They will lay their eggs in the spring, enabling young to emerge in late summer. Centipedes – Centipedes are long, flattened, many-segmented insects that have one pair of legs per segment. The centipede is 1 to 1 1/2 inches long with very long, slender antennae and 15 pairs of long legs. Centipedes thrive in moist environments, primarily damp basements and bathrooms. Cigarette Beetle – Cigarette beetle is reddish brown in color and about 1/8 inch long. They have a humpbacked appearance due to their head being bent downward. Cigarette beetles have saw-like antennae and smooth wing covers. They commonly feed on dried fruits, pet foods, grains, spices, nuts, seeds and are generally found around windowsills. Citronella Ant (Large Yellow Ant) – The citronella ant is a pale yellow, and produces a lemony smell when crushed. The insects range from 1/4 to 3/16 inches long, and have a circle of hairs at the tip of their abdomen. Citronella ants will nest in rotting wood, soil, or the foundation of homes. These ants emerge is swarms in early spring, and are seldom a concern in homes except during swarming season. Citronella ants can often be misidentified as termites because of their size and time of year, which they appear. Cockroach (American) – The American cockroach is two inches long when mature and red-brown in color. These insects are characterized by fully developed wings that completely cover their abdomen, enabling them to fly from building to building. American cockroaches are not commonly found in homes but are instead found in sewers, groceries, restaurants, and office buildings. American cockroaches inhabit warm, damp locations. Female American cockroaches can produce an average of 60 egg capsules in their lifetime, each capsule containing 25-35 eggs. Cockroach (Brown Banded) – Brown banded cockroaches are 5/8 inch long when mature with dark brown bodies and with red-brown wings which cover ¾ of their rounded broad abdomens. Males are narrower and lighter colored with light brown wings that completely cover their narrower abdomens. Both sexes have two light yellow-brown bands that run across their body. These insects tend to hide up off the floor, and can generally be found in or under furniture and appliances. The female lays an average of 13 egg capsules in her lifetime, each capsule containing 10-18 eggs. Cockroach (German) – German cockroaches are 1/2 to 5/8 inches long when mature, are light brown to tan in color, and have fully developed wings. German roaches have a shield-like segment behind their head, which has two dark parallel bars on it. The German cockroach in the most common household insect in the United States. They typically infest kitchens and bathrooms, but will live inside heated structures where there is food, water and harborage. The female German cockroach can produce 4-8 egg capsules in her lifetime, each capsule containing 30-40 eggs. Cockroach (Oriental) – The Oriental cockroach is 1 inch long for a male, and the female is 1 1/4 inch in length when mature. These roaches are red-brown to black in color, and the wings cover 75% of their abdomen. During the female’s lifetime she will produce an average of eight egg capsules, each of which contains 16 eggs. These roaches are not commonly found in homes, but can be abundant in sewers and commercial facilities including restaurants and groceries. 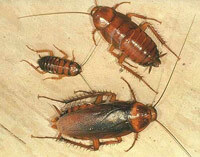 Oriental roaches prefer to feed on starchy foods but will eat various other items including decaying organic matter. Drugstore Beetle – Drugstore beetles look almost identical to the cigarette beetle but have distinct grooves in their wing covers and a club antenna. Drugstore beetles commonly feed on all types of food and spices as well as leather, wood, hair, books, and drugs. Earwigs – Adult earwigs are 5/8 inch long and dark brown in color with a red head and pale yellow-brown legs. Earwigs will generally have two pairs of wings and pincer-like appendages at the end of their abdomen. Earwigs usually live outdoors under stones or other protection and feed on plant material. Earwigs will sometimes invade homes, doing so generally at night. House Cricket – House crickets are about 7/8 inch long, and yellow-brown or straw colored. These crickets have long, slender antennae and wings that lay flat on their backs. House crickets can live indefinitely in homes or other structures. When raised under ideal conditions each female house cricket can lay an average of 728 eggs. House crickets are seldom a major problem in homes until they try and move indoors in the winter. Male house crickets will make a chirping noise by rubbing their wings together. Indian Meal Moth – Indian meal moths have a 5/8 inch wingspan, and the wings are a burnished copper, with a gray band near where they attach the body. Indian meal moth larvae are small caterpillars with distinct legs on the front three body segments, and four pairs of prolegs on the abdomen. 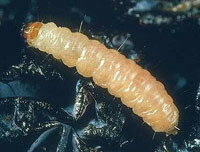 The larvae are dirty white in color, and range from 3/8 to 3/4 inches long. Indian meal moths are the most common stored pantry pests primarily feeding on whole grains, dried fruits, nuts, chocolate, beans, crackers, and pet foods. Larvae produce silk webbing over the surface of materials upon which they are feeding. Adult females can produce as many as 400 eggs in 18 days. Millipedes – Millipedes are long, cylindrical, many-segmented, worm-like insects. Each millipede has two pairs of legs attached to each apparent body segment. 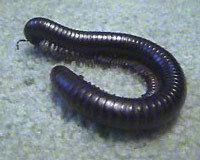 Most millipedes are brown or black and range in size from 5/8 to 4 inches in length. Millipedes are found in situations that combine a great deal of decaying matter with a highly moist environment. Millipedes become structural pests when they invade homes and are usually traced to a source that is high in moisture and contains a large amount of organic matter. Odorous House Ant – Odorous house ants are often the most common ants found in the Maryland area. 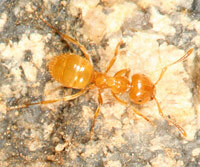 The worker ants are brown-black in color and 1/8 inch long. The best identifying characteristic of these ants is the coconut like smell they produce when they are crushed. These ants often nest outdoors under stones or logs, but can also nest indoors in wall voids especially around heat and water sources. Every nest employs several queens, each of which lay one egg per day. These queens disperse regularly and form new colonies by “budding” off the original colony. Odorous house ants prefer sweets but will feed on any household foods. Powder Post Beetles – Powder post beetles are a type of wood boring beetle, which is not commonly seen by humans. These insects are largely recognized by the damage they produce in wood. This damage is found in all types of wood and looks like small black pinholes. Areas of infestation need to be soaked well with pesticides to eliminate the infestation. Silverfish – Silverfish are wingless insects that are 1/2 inch when fully grown. They are covered with silvery scales and flattened with a carrot-shaped body. Three long, slender antennae-like appendages project from the end of their abdomen. They can be found living in warm, moist locations in homes, particularly attics. Silverfish are fond of books and paper as well as glues and pastes found on wallpaper, labels, and paper products. Silverfish are very long-lived, commonly living 2-3 years. In this region, cedar-shake shingles are a major harborage area for silverfish due to their ability to hold moisture and warmth. Social Wasps (Yellow Jackets, Bald-faced Hornets, European Hornets, Paper Wasp) – All social wasps have a very distinct head with chewing mouthparts. All social wasps have 4 wings, which are clear or smoky brown. Yellow jackets are generally marked with bright yellow and black patterns and often nest in the soil. Bald-faced hornets are similar in appearance to the yellow jacket except they are white and black, and tend to nest in large nests on trees. The European hornet is 1 1/8 inches long, and brown and yellow in color. Paper wasps are generally yellow and brown, and will nest anywhere protected from the elements. All social wasps will sting when threatened and can produce colonies as large as 30,000. Solitary Wasps (Mud Dauber, Cicada Killer) – There are many solitary wasps, but most common are the mud dauber and cicada killer. These solitary wasps nest individually. 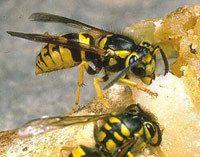 Solitary wasps are generally not aggressive but do have stingers and will sting when handled. They range in size from 1/4 to 2 inches long and vary in color from dull black and brown, to brilliant red, yellow or blue. The mud dauber will build a mud nest that is generally globular and are found in sheltered areas. The cicada killer will burrow in the soil, expelling a great deal of soil outside of their holes. Shield Bug (Stink Bug) – Stink bugs are fairly larger in size generally measuring 1/6-3/4 inch in length. Stink bugs found in this region are most commonly dark gray to brown and generally appear around windows, doors, and fireplaces. There are more than a dozen species reported in the U.S., with the newest species recently being introduced to the U.S. in the late 1990�s. Due to this new species being introduced recently, the increase in numbers of infestations has rapidly increased over the past few years. 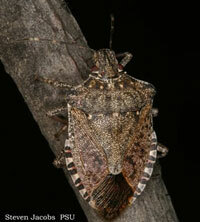 Stink bugs generally feed on a variety of host plants, primarily apples, figs, mulberries and citrus fruits. When stink bugs feed on these fruits they will leave a distortion on the fruits leaving them unmarketable. Stink bugs are generally harmless to humans and homes, but can become a problem infesting homes in the fall as the weather begins to cool. Stink bugs will enter the homes thru cracks and crevices of the home to find over wintering sites to stay warm until spring when they we reemerge. Stink bugs can be difficult to treat due to their hard exoskeleton and ability to fly, yet liquid chemical treatments can dramatically decrease numbers entering the home. These bugs get their name from an obnoxious smelling fluid they can eject from their sweat glands to protect against predators. Subterranean Termite – The subterranean termites are the only termite found in this region and pose the biggest threat to homeowners. Winged reproductive termites are flat, black, 1/2 inch long insects. Worker termites are wingless and about 1/4 inch long with white bodies and a round yellow-brown head. Soldier termites are also wingless and have white bodies but are large, rectangular-shaped insects with yellow-brown heads and large mandibles. Subterranean termites feed in wood but generally form colonies in the soil. Worker termites build mud tubes from their colonies in soil to the wood structures on which they feed. No matter where the colony is placed, it most often is connected to soil or close to a source of moisture.